Iridium, through its affiliates ACS Infrastructure (USA), was named in July 2018 Preferred Proponent by the Windsor Detroit Bridge Authority (entity dependent of the Federal Government of Canada) to design, build, finance, operate and maintain the Gordie Howe International Bridge Project connecting Windsor (Canada) and Detroit (USA). The project is valued at over 3.8 billion canadian dollars and will be partially funded with private capital. Led by Iridium´ subsidiarie ACS Infrastructure , Bridging North America is also formed by Fluor and Aecon, with each company holding (respectively) a 40%,40%/20% share across the consortium. Aecon formally requested joining the group following the award of the contract to the team formed by ACS, Dragados and Fluor. A total 1.033 billion Canadian dollars are privately funded, including a long-term (35-year) and medium-term (20-year) bond issuances in the Canadian markets, both with A- rating by Standard & Poors and jointly underwritten by RBC and HSBC. Short-term finance during the construction period includes a bank loan syndicated by five institutions: Royal Bank of Canada, Desjardins du Quebec, TD Bank, Mizuho and HSBC. 93 million Canadian dollars of private Equity is injected by the consortium members at the end of the construction period and it is, until then, guaranteed through letters of credit. The public-private-partnership (PPP) scheme for the project includes the design, build, finance, operation and maintenance of a new international bridge between Windsor (Canada) and Detroit (United States), as well as the ports of entry at each side of the border. 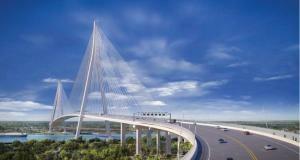 The scope includes a six-lane (3 per direction), 2.5km cable stayed bridge which will cross the Detroit River between both countries and whose main span of 853 m will be the longest in North America and one of the largest in the world. The project also includes the construction and maintenance of the Canadian port of entry (53 hectares) and the US port of entry (68 hectares) and the construction works on the I-75 Highway that connects Detroit with the Bridge. The Windsor-Detroit corridor is one of the main and most congested international corridors in North America and plays a fundamental role in the economies of Canada and USA, particularly in trade between both countries and in the automobile industry. The project will generate additional crossing capacity to meet increased long-term international trade and travel demand, supporting the economies on both sides of the border.